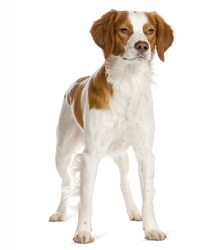 The Brittany breed originates from France. In the mid 1800s, English gentry traveled to the region to hunt game birds and took with them their well-trained Pointers and English, Irish, Gordon and Llewellyn Setters. At the end of each hunting season, these dogs were often left behind with the local people until the next season. It is thought that the local folk mated their ‘native’ type hunting dogs with the British Pointers and Setters and, as a result, consolidated on a medium sized hunting dog that became very popular. The breed is known by the French and other EU nationalities as ‘Epagneul Breton’, while in Ireland and Canada it is still called the Brittany Spaniel. Elsewhere in the world, it is simply known as the Brittany. Most countries have today dropped the reference to ‘spaniel’ as this breed actually points rather than flushes its game. The Brittany is now classified as the smallest of the ‘hunt, point and retrieve’ breeds and, as such, does not compete in spaniel trials or shows. Most Brittanys are born with a long tail, but the breed also has a gene for natural bobtails, which appear in litters from time to time. Over the years, the breed’s reputation as a compact, friendly and loyal hunting companion has seen its popularity grow worldwide. The Brittany is popular in the show ring in many countries, performs with great merit in gundog field trials throughout the world and is becoming popular in agility and obedience circles. The Brittany is loyal, active and affectionate- a great family dog! This breed is highly intelligent, sensitive by nature and does not tolerate harsh handling. They are gentle and affectionate, yet full of life and exuberance. They have high watch dog ability and have an acute sense of hearing. They will alert an owner to unusual happenings but in general, will be friendly towards strangers. As gundogs, Brittanys have high energy levels. They will need to be kept active and their minds stimulated. Consider getting your dog involved with a sport, such as flyball or agility. However, a walk or run will also do wonders for your dog. Be prepared to spend quite a bit of time exercising your dog due to its high energy levels. The Brittany is a smart breed and can be great to train. Patience will be needed when they are young pups. Puppy preschool and ongoing training will help them develop good manners and learn the boundaries set by their owner. Being a happy-go-lucky dog, positive reinforcement during training is a must. The Brittany coat is not particularly long or thick, but it does require a regular brush to maintain good coat health. It is generally classified as a breed needing low to medium grooming requirements, but extra care will be required if exhibiting at shows. Because they are still popular as hunting dogs, they do have a high energy requirement and need abundant, regular exercise. Like all dogs, the Brittany requires regular tick, flea, intestinal worms and heartworm treatments. Consult your veterinarian on treatment options. Desexing and vaccination against diseases, such as the deadly parvo virus and highly infectious canine cough, are also important to discuss with your vet. The Brittany is best-suited to an active household that can keep up with their high energy level requirements. They are affectionate and good natured so will be great companions for a family and children, provided supervision with children (like any breed) and early obedience training is instilled. Because of their high energy levels, Brittanys are not suited to apartment life. They can live outdoors in temperate weather but are highly social dogs and need human interaction. Because they are very biddable, activities such as agility and obedience, gundog field trials and showing are popular activities. Anyone interested in casual hunting will find them an ideal companion.